A 25-metre poolis heated to 20.8 degrees (photo: Helen Bay). Nested in the stunning nay of islands (photo: Quentin Long). Helen Bay includes a homestead and five luxury suites (photo: Quentin Long). 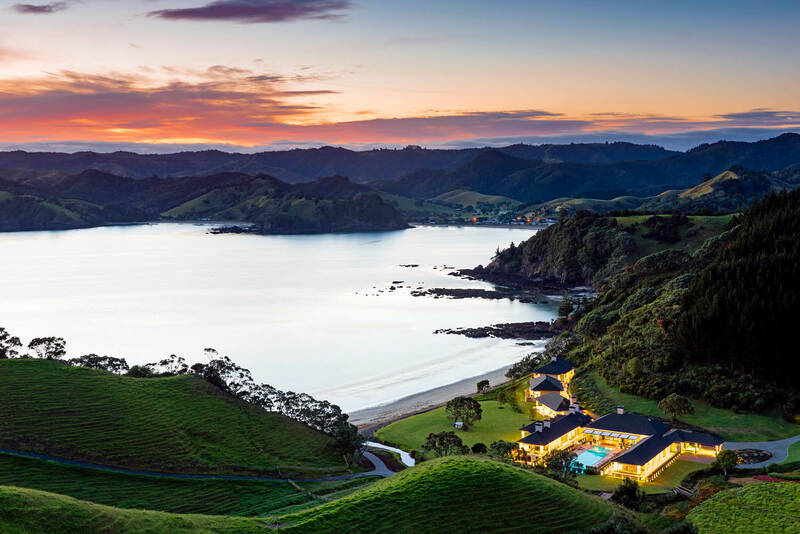 On a private beach in the Bay of Islands, 50 staff busy themselves attending to the guests who fill just five luxury suites. It is extraordinary to behold. Not perfect, but quite extraordinary. I am at Helena Bay Luxury Lodge, the new standard-setting property in New Zealand’s production line of ultra-luxe lodges loved globally by well-heeled travellers. The property includes a homestead, a Michelin-starred private chef, a spa and fitness area, a working farm and three private bays with beaches. Activities are endless – fishing, walking, biking, swimming, cooking. It is an entire estate for a maximum of just 10 guests. It was originally conceived as a private home for a wealthy international billionaire, but he generously decided to share this wonderful slice of New Zealand with guests, adding three villas to the project, with each containing five suites. Located three-and-a-half hours’ drive north-east of Auckland, the setting is sublime. Surrounded by verdant green hills and a large, heavily wooded and revitalised subtropical rainforest on the edge of one of the Bay of Islands’ famed bays, the lodge’s buildings are cosily enclosed by steep hills: it’s private, discreet and exclusive. 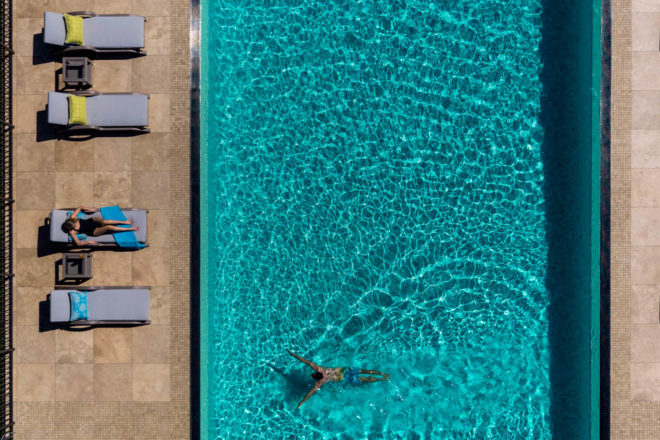 A 25-metre pool (perfectly heated to 20.8 degrees) sits in the middle of the U-shaped homestead. One arm houses the spa and fitness room; the other a formal dining room, bar, private library, sitting room and casual inside/outside dining patio with magnificent views to the beach and sea. A grand hallway connects the two arms, the walls adorned with pieces from the owner’s art collection plus hundreds of Swarovski crystals, which form a bedazzling canopy through to the formal dining room. Magnificent rugs of exquisite craftsmanship cover many of the floors – the one underneath my bed is so exquisite I want to roll it up and take it home. So, what is the imperfection to which I refer? The design of the villas and suites perhaps betrays the notion that the guest suites were an afterthought. The separate lounge has an abundance of sofas and recliners, all facing a huge and cosy fireplace with a writing table jammed into one corner. The walls are mostly bare, made more stark by the very high ceilings. A TV is mounted on the wall behind the sofas, with only the single chair at the writing desk getting an angled view. Of course, this is of little consequence really as the bedroom, big enough to swing several cats in, has its own mammoth TV, and floor-to-ceiling glass doors, that effortlessly open to a covered terrace with gorgeous views of the wider bay (which make for much more compelling viewing than anything on the screen). The lapping sound of the waves on the beach below provides a gentle soundtrack. The king-king-king bed could house a football team, but its orientation towards the television and not to the magnificent view perhaps needs to be rethought. It is the bathroom that lets down all the ambition, quality and location that is Helena Bay. A shower and toilet are squeezed into a space I estimate to be no bigger than two metres wide and three metres long. But where is the bathtub? Even if you were determined to squeeze one in, it would require some nifty design to fit anything bigger than a thimble into the cramped space. It strikes me that if you are going to call yourself a luxury lodge, you’d better have a very good reason not to have a bathtub. It is disappointing considering the craftsmanship on show throughout the rest of the lodge, and along with layout issues, is a case of missed opportunities. The service ethos, however, is peerless. The entire property is managed by a canny Scot, Neil McFarlane. A former skipper of several European billionaires’ super yachts, he has brought the same attitude to Helena Bay. I test this theory during my stay. How about a massage in half an hour? Absolutely. In 30 minutes I am lathered in a remedy of warmed oils, and surrounded by pine aromas. My masseuse is no slouch, having worked at many of New Zealand’s other luxury lodges and studied overseas. Helena Bay’s menu and food is created in collaboration with the Michelin-starred Don Alfonso 1890 restaurant and one of its executive chefs, Michele Martino. Michele looks after what happens on the plate and oversees gardeners’ efforts in what are best described as cathedrals of vegetative splendour. Michele is a charismatic Italian who talks with passion about the opportunity to grow such fresh and pure ingredients in this heavenly slice of the world. “My skin went like a chicken’s,” he explains upon seeing the produce opportunities of the garden. We spend a good hour happily snipping zucchinis and tomatoes and herbs, some of which we just can’t help but devour right there and then. Our conversation is mostly through mouthfuls of tomato, basil and sage. Back in the homestead, Michele shows me how to cook the perfect basic Italian spaghetti dish. Sitting on the patio looking out to sea, I marvel at how such simple ingredients can be lifted to such heights and wonder why the hell my tomato sauce never tastes so good. In the evening, the day’s harvest is presented in a dazzling array of dishes – a gourmet degustation meal just for me. Dishes like seared yellow-fin tuna; John Dory fillet with salmon roe, carpaccio of black Italian truffles and cauliflower; slipper lobster and scampi tartare with gazpacho; 40-day air-dried Helena Bay Wagyu beef with asparagus puree. Food critics would be in rapture. 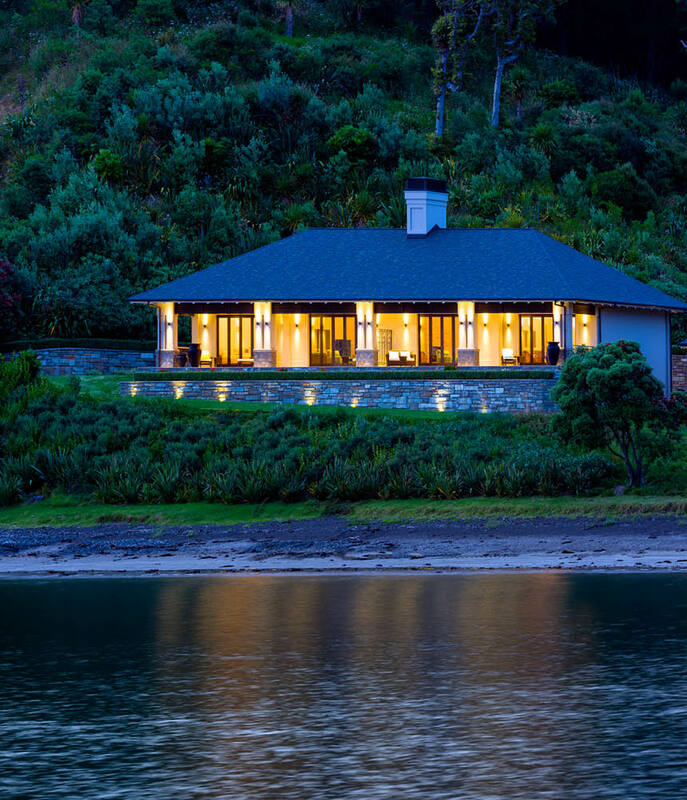 Helena Bay is a worthy addition to the luxury lodges of New Zealand. Sure, there are things that could be tweaked, but the quality of the experiences and service is what really matters and what makes this a wonderful piece of the world, with or without a bathtub. Rates at Helena Bay Luxury Lodge start from $1175 single occupancy in low season, and are all inclusive of meals and drinks.